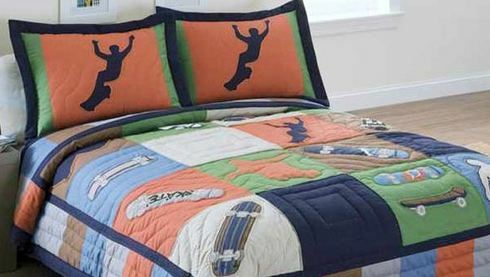 Get your kid’s imagination flowing with skateboard bedding. Skateboard bedding is a simple thing to do for a child. Put sheets with skateboarders on them and a younger child will feel like they are hanging with the pros! I remember how cool it was when we got star wars bedding way back in the 80’s.It was seriously the best.My brother and I thought of ourselves as Jedi and Storm Troopers instantly. As a child having boring daily things like pillows and bed sheet transformed into an expression of the coolest thing like skateboarding. It doesn’t take much and they will feel like they are skateboard masters. Skateboard decorating is simple and often overlooked by the skateboard companies. They usually market to the teen crowd. Teens don’t care too much about bed sheets. There are millions of younger skaters who would love a skateboard theme room. They are the ones who really do care about stuff like this. Put a positive spin on your little shredders interests and set them up with a few simple bed sheets and accessories. Their room is there little kingdom and filling it with the positive and energetic influence of real skateboarding will give them a sense of ownership and pride in their room. Yes even young children take pride in things. They may even keep it cleaner because of it. Let’s not cross our fingers though. It may make bedtime a little tougher at first because every time they see their bed they will want to jump around like a skater. After a while it will just be a source of joy for your kid. Make em feel like they are Tony Hawk. Set them up with skateboard themed bed sheets.